I am pleased to celebrate the valour and courage of my Uncle, John Lafferty, native of Prince Edward Island, during the Second World War. It is my understanding that John gave his life to save others by assisting in the locating of landmines for dismantlement, which were buried, by retreating Nazis, close to the German frontier. 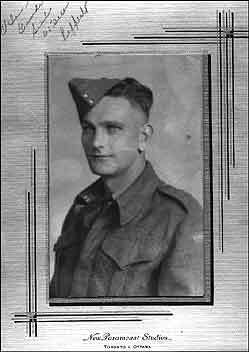 Private JOHN LAFFERTY, Royal Regiment of Canada, R.C.I.C., who died age 35 on Monday, 11th December 1944. Private LAFFERTY was the son of Patrick Francis and Priscilla (Dowling) Lafferty of Prince Edward Island; husband of Helen Catherine Lafferty, of Saint John, New Brunswick. Awarded The France and Germany Star. Remembered with honour at the GROESBEEK CANADIAN WAR CEMETERY, Gelderland, Netherlands. "On the Memorial in the Canadian War Cemetery at Groesbeek are inscribed the following words: Pro amicis mortui amicis vivimus, We live in the hearts of friends for whom we died." In the perpetual care of the Commonwealth War Graves Commission. Pte John Lafferty, RRegtC, is listed in the Book of Remembrance - Second World War -1944- Page 357. Six Books of Remembrance, containing the names of Canadians who fought in the wars and died, are kept in a Memorial Chamber located in the Peace Tower on Parliament Hill, in Ottawa. These Books are accessible to the public on the Internet, via Veterans Affairs Canada, Records & Collections. Every morning at eleven o'clock, a Staff Guard in uniform, makes a ceremonial bow, salutes and turns a page of each Book. The Books commemorate Canada's soldiers, nurses, sailors, merchant marines, airmen and service women who gave their lives for freedom. Return to Lest We Forget Page!